Hi loves! Just a quick and simple post as I have to go out the door this moment. Another dotticure! 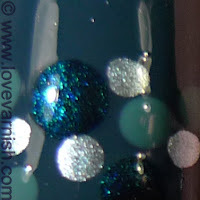 This time I used 1 coat of CND Urban Oasis as my base, and used a franken called Envy Me, Frank for the large dots. I added a size smaller with Sinful Colors Athens and the smallest are China Glaze Metallic Muse. I love this color scheme as teal is my favorite color ever ♥. Oooh, I love the colors you chose! Love dots! The choice of colors are great. This is so pretty!! Gotta love polka dots ;0). Thanks Angie, teal is my favorite ♥. They are growing on me! Thanks :). Yes I adore them now!